I believe that I along with most people live somewhere in the middle. For most of my life that has been just fine. Although I am registered to vote as one of the major parties, I do not vote party line but instead on a big picture. I have proudly voted for presidential candidates from both parties. I remember when I was finally allowed to vote, I thought my voice would be heard. I quickly realized that there was no truth in that and for most of my life have not had the ability to vote for a great candidate for president. Instead I have voted for the person who I hoped would do less damage. Somewhere in the last few years it seems to no longer be possible to live in the middle in this country. I guess it started under G.W and has gotten significantly worse. We can no longer even have conversations without someone getting offended. Name calling, finger-pointing and accusations are common place. It is us and against them yet in the end we are all them. The Sandy Hook tragedy should have been a time for us to pause, even come together as a nation. Instead our political leaders and the financial powers are both using it as a back drop to drive an agenda. Most people in this country agree that there should be changes to our gun laws. Most people if treated like adults would be able to have a real conversation about it. Instead we have ranting, raving and executive action. I remember when I used to work and had to achieve a goal. I would often get so frustrated trying to get the General Managers of the stores to buy into what I wanted to achieve, they did not work for me. I would continually be told that leadership was using my influence to get them to partner with me to achieve the goal. I did not always get everything I wanted, nor did they and many of the conversations were heated, but we would always get something done. I could not bang my fist and say tough this is the way it is. 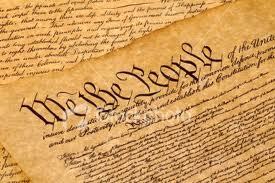 We have a constitution in this country. We have three branches of government. We have elections every two years for the house, four years for the President and 6 for the Senate. We who vote expect those who we vote for to work together. If they do not we can vote them out. We can allow our voices to be heard. Our government was set up intentionally to move slowly. Watching television today made me sad. I saw the man who is supposed to be the most powerful leader of the free world give a campaign speech. People applauding, children on stage, tweets and letters being used as prop. Name calling and power over reach. The NRA “declared war” and the media is gushing over The President. I heard nothing about our violent culture, or the “honey Boo Boo” culture of our society. Nothing about hollywood and our blood lust in movies. Nothing about the number of children living in single parent households. See, if we actually want to do something we need to really do something. Passing a law just to ride the press wave helps no one! I fully agree with background checks, real reform in mental health care and many other things. I believe our culture is too violent. I do not let my girls play with guns. I do not let them play violent games. I do not let them watch anything rated higher than PG. I worry everyday about my girls. This world scares the hell out of me! But with that said, trashing our constitution scares me even more. Where have the leaders gone? I remember When Bush pushed through the Patriot act thinking it was wrong. We all wanted to “feel” safe. We have a group of people who by the actions of our leadership can not, will not and just may not even be able to work together at this point to achieve anything. That does not mean that the president gets to circumvent the process. The big boys get paid very well. The begged for the jobs. It would be nice to see them start doing them. If you read this through to the end, thank you. This is my opinion and I fully support a free society to be able to respectfully express opinions.